Stability: Our software is powered by FFmpeg to do the Restreaming & Transcoding of your streams. FFmpeg is the leading multimedia framework, able to decode, encode, transcode, mux, demux, stream, filter and play pretty much anything that humans and machines have created. It supports the most obscure ancient formats up to the cutting edge. No matter if they are designed by some standards committee, the community or a corporation. 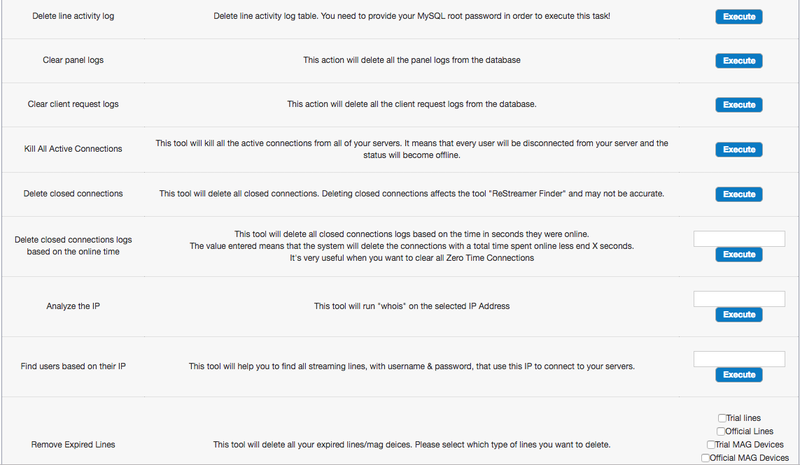 Security: We provide an Addon who will increase the security of your Streams even more. We guarantee that it will be hard, even impossible for someone, to steal your streams. Let’s got to work and test the new Version 2.4.2. You will notice that the fingerprint addon is now free but it is limited to ONLY send one message to a specific client and not massive as the pay version add-on does. MAG BOXES and Co, like TVIP and BLOMC Boxes, Emulators, Clones and other Stalker Middleware Boxes! 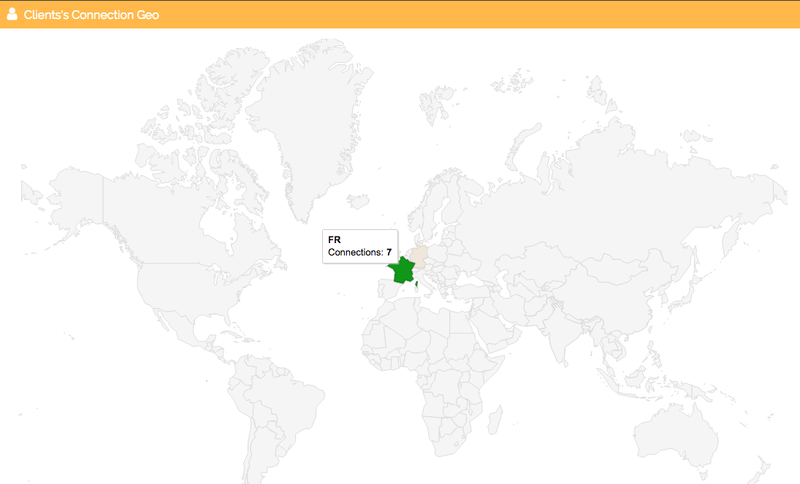 The “DASHBOARD” has now the much asked for Clients’ Connection Geo again, what we know from the older Version 1. As you can see, the optimal setting for most users is 80 in Flood Limit, and 2 in Request Frequency. This setting will block ONLY customers with no valid or expired Lines! Their IP simply will be blocked and can be seen in BLOCK IP/CIDR Section later, where you are able to unblock as well if you want. We also see the “XC Support ALLOW AUTO-LOGIN”. This you activate by putting YES in. Advice: Pay attention that you have the latest Firmware installed. Hint: Many clients are having trouble to put the Portal in their boxes after they bought it, so I’ve included a useful video showing how to put a Portal in a MagBox for your customers. 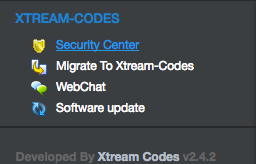 Update: This feature was taken OFF from Xtream-Codes a couple of days ago… Not a good decision, more Tickets will be created as a result, I guess. Suspicious Files will be seen there, on all of your servers, as well as intruders or hacking attempts. I must say, why not before? Great idea, great feature! Giving your Reseller A the choice to create a Sub-Reseller B! So far so good, if there would not be the pricing sector. I try to bring her light into the darkness. Now I will try to explain the most important part for Admin’s and also Resellers. Who create a Sub-Reseller. The Margin, the pricing. A lot of confusion about that, as most of the Admin’s also the Resellers’, who create a Sub-Reseller. Note: Only Reseller Acan create a Sub-Reseller B, and that is then the end of the line, a Sub-Reseller can not create another Sub-Reseller. We call here in the following examples with ADMIN (the Owner of the Panel), Reseller A (created from the Admin) and Sub-Reseller B (created from Reseller A). Admin charges Reseller A with 1 Credit / 1 Euro. Reseller A creates a Sub-Reseller B, and now Reseller A sells Credits to Sub-Reseller B, right? But for sure Reseller A wants to make a profit, remember, Reseller A pays 1Credit/1Euro already, so his created Sub-Reseller B should be charged more than 1 Euro for 1 Credit, right? The easy way for Reseller A would be to calculate in percentage, meaning: If he wants 50% Profit, he has to charge Sub-Reseller B 1.50 Euros for 1 Credit. Other way, if the Admin charges the Reseller A 5 Euros for 1 Credit, then Reseller A could theoretically charge every price what is over his own price of 5 Euros. Example: 1 Month – 1 Credit (Reseller A’s price is 5 Euro, he charges the Sub-Reseller B 7 Euros). I hope that brings a little light in Reseller-SubResellers pricing politics. This system gives the ability to groups where the Reseller status is ON, to be able to make their own reseller which we call subreseller.A subreseller has similar features and abilities like the Main Reseller, with the difference that his Users, Credits & Packages are being controlled by his owner. I know definitely now, like I mentioned already in Part 1 and 2, that the developers are not great fans of movies. There is still the almost whole range of movie editing section missing, and I would also like to see, that a Movie and a Stream could directly be being assigned to a bouquet. 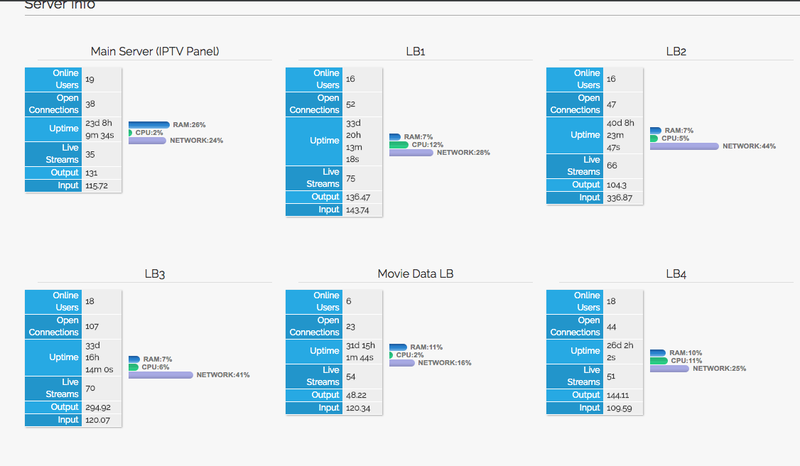 By the way…I never really managed to sort the categories out. Meaning that a category could be moved around by choice, up or down. At first place, at the end. And so on. There is a section MANAGE CATEGORIES, but I must confess, I never came clear with this. Sorting categories works by pressing one “category” down, and move it up or down. Results are shown only in Magboxes later. VLC & Co? No chance at all. All mixed up. Stream Tools seemed promising, But somehow I missed here something, I guess. For me useful only in deleting streams and even mass delete is of no problem. To go there, MANAGE SERVERS, edit Main…Performance Settings, activate BOOST PERFORMANCE to YES. 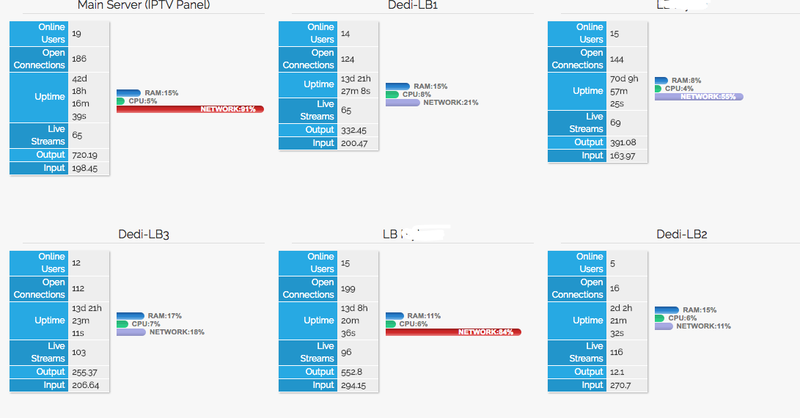 The Bad News: Totally EMPTY MAIN SERVER, not one single Stream on it, and no VOD, completely empty! The Good News: Before v.2.4.2 the recommendation was a 40-core Beast! You read it right, a “cheap” 40-core EMPTY Main was necessary, to enjoy the boost. My personal recommendation is minimum 32GB RAM with a 16-core server. This gave me good results in extensive testings. As we can see in the first picture, the usage of the network is continuous measured and absolutely exact! In case of overloading your bandwidth, you will be warned about. As you see, with Xtream-Codes Backups Cronjob’s, you will be safe and sound, always. You even will be warned if your peer uses a HIGHLY UNSAFE cracked Panel Version v.1 with YOU BET…BACKDOORS! Amazing new features, too much to count even, everything is possible! Very fast reconnects of streams, with no kind of interrupts for clients. NO REAL MOVIE EDITOR SECTION! Still….